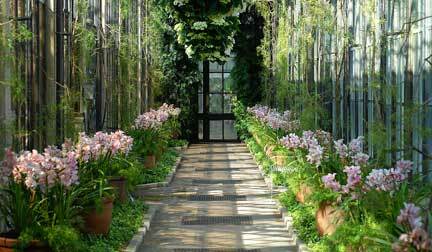 The orchid display greenhouse forms a wing off of the main conservatory. Kennett Square, Pennsylvania, is known as the "Mushroom Capital of the World" for its miles of culinary fungus houses and its annual parade held each September. 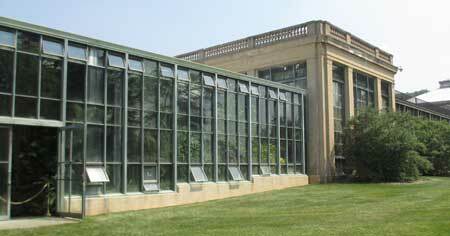 A few minutes down the road, in Chadds Ford, is the home of three generations of renowned painters – NC, Andrew, and Jamie Wyeth – an area affectionately named ‘Wyeth Country.’ However, the attraction that draws nearly one million visitors a year is Longwood Gardens, which is arguably the most impressive horticultural garden in the United States. The great hall in the conservatory. Founded in the early 1900’s by industrialist Pierre S DuPont, the property spans over 1000 acres and features a dazzling array of outdoor theme gardens, fountains, water lily ponds, and conservatories. Inside the European-inspired glass greenhouses can be found every imaginable type of exotic flower, cacti, bromeliad, fern, and bonsai. 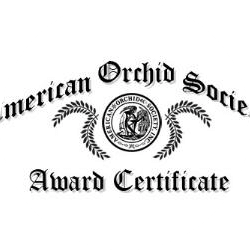 The orchid collection is diverse with over 6500 specimens. 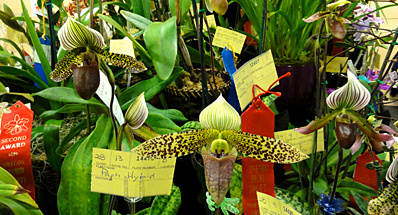 Hobbyists are thrilled to find examples of nearly every commercially viable orchid genus on display. The blooming plants are not grouped together. 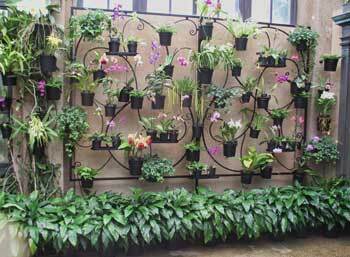 Instead, they are presented individually via ornamental wrought iron racks covering all four walls. There are multi-floral lady slippers with their elongated petals reaching down, bright pansy orchids with their intoxicating aroma, and massive vanilla vines escalating towards the ceiling. Orchid Curator Lorrie Baird ensures that the delicate blossoms are always fresh. beautiful display. Photo A.E. Chadwick. 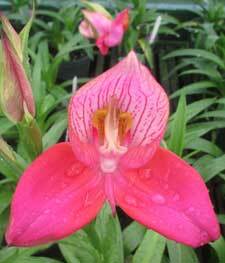 In professional grower’s circles, Longwood is often cited for its excellence with the unusual and difficult to cultivate African genus, Disa. 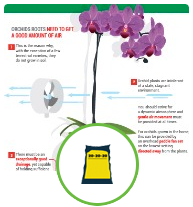 These plants may not dry out under any circumstances. 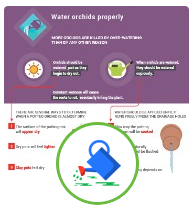 In addition, the irrigation water must be of the highest quality - no traces of chemicals (such as chlorine), very low salt content, and a pH of less than 7. The horticulturalists in Kennett Square have not only grown these colorful flowers to perfection but also hybridized them since the mid-1960’s. The tiny seeds are planted on milled sphagnum moss beds and within three years are blooming. Inquisitive visitors jump at the chance to photograph these rare gems. A Disa hybrid at Longwood Gardens. 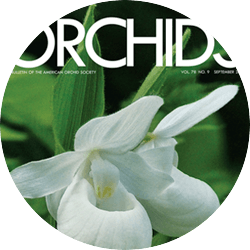 For decades, Longwood had a tradition of filling two matching show-cases in their orchid display house with glamorous and breathtaking Cattleya flowers. One side contained purple blossoms and the other side held white. The year-round demands of such an exhibit required hundreds of plants that were selected and staged for their precise blooming month. 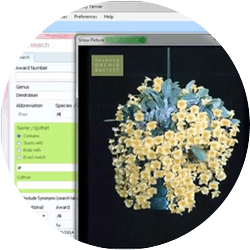 Recently, the show-cases have been modified to give the growers a little more flexibility and now include other lovely genera. 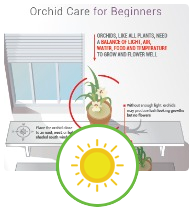 greenhouse is lined with flowering cymbidiums. Photo G.Allikas. 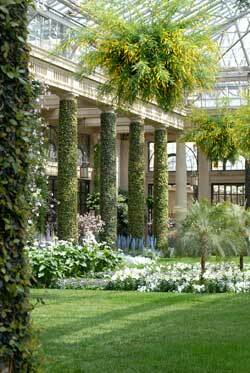 I was fortunate to grow up just minutes from Longwood Gardens. My father would ‘drag’ me through the conservatories every time he had out-of-town orchid experts to entertain. Little did I know that one day I would be going into ‘the business’ with him. Today, I still marvel at the sheer magnitude of the steel structures and the lush tropical plants that tower over my head. 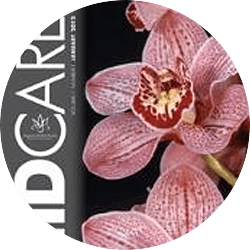 The orchid collection is a ‘must-see’ for any aspiring hobbyist.